I feel our life is like a train, picking up and dropping off passengers at every station as we move on. We will never know whether we will meet the same passengers again. Every time we have a farewell gathering, it means that we will be missing somebody aboard. Yesterday, Friday, 27th June 2014 was such a day. We had to formally bid goodbye to one of our colleagues who had been with us for the past two years and five months. Mr. Mani Kumar Shingdan has been a very helpful and supportive staff. Perhaps, he has been the best driver we had ever got since as long as I can remember. He was a very convenient person to work with and he would never deny any request to go anywhere anytime, at least for me. I am sure he must have done the same to others too. He was a very reliable and trustworthy person, and I am sure he will be missed a lot by everybody in the Division. Yesterday at 01:00 pm, we sat together for a simple lunch in a small cabin inside our office cafeteria to show a gesture of our gratitude for our outgoing colleague. Although we were talking and laughing, I know that deep in the heart, emotions were running quite high. “Mani was the best driver we have ever got and we were so fortunate to have him aboard” began the Chief Programme Officer, Ms. Rinzin Wangmo in her opening address. “we were lucky to have a new car with Mani as the new driver as soon as he joined us, and we didn’t have any problem till date” she said. As a token of our appreciation for his sincere service, The Chief handed over a small souvenir to Mani on behalf of the Division. “I hope this would help you remember us!” she said smiling. Mani sounded emotional as we were. “I was very happy to work with you all here and I think I have worked hard to live upto your expectations, but if I have failed to do my duties properly at times, I would like to kindly request you all to forgive me” he said. He even cited the incident when he had dropped off Madam Chief at the Ministry and did not wait for her, thinking that he was asked only to drop her off. 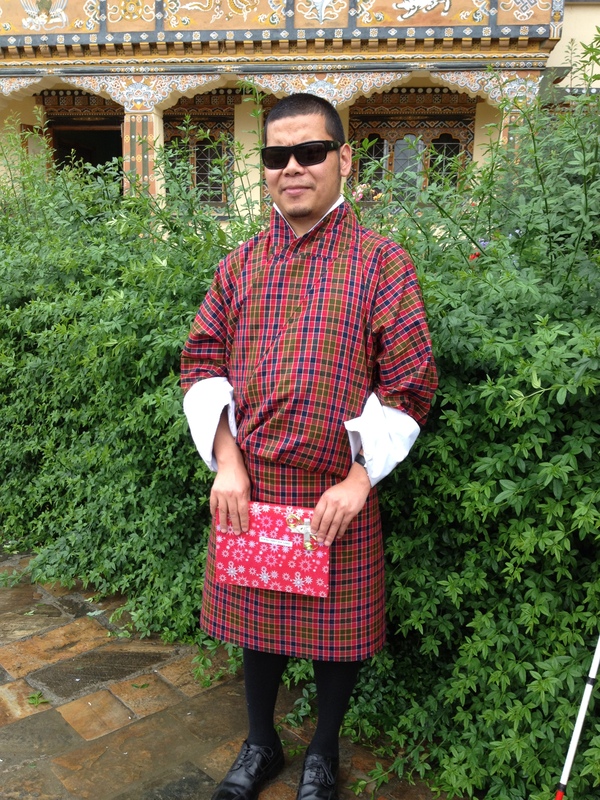 Although Deki Lhamo was not there, he said he had left her in the Ministry once and that he wanted to apologize her for that as well. In fact, he conveyed this message to everybody in the room. Then unlike other farewell gatherings, he gave us each a nicely packed and well-decorated gifts. “I also want to give you a small gift as a token of rememberance from my side because I could not dare to imagine leaving my colleagues without leaving behind something to be remembered” he added. Mani, your gift is very precious. I know you were saying the diary books you have gifted me may not be useful to me but as you suggested, my kids are extremely happy to have them. As soon as I showed your gifts to them, instinctively they chose their favourites. My son, Thukten Subba chose the one with the picture of Ben Ten and my daughter chose the other one with the picture of a girl. I have advised them that they should write down whatever interesting things they do everyday in their diary. They have already started writing down since yesterday. No matter how time goes by, I shall always remember you. The world is not too big and we shall definitely meet someday. We shall continue to keep in touch on social media and certainly we shall catch up sometimes. I would like to thank you very much for your wonderful gifts and I shall cherish it forever. I would like to heartily wish you all the best of luck in your future endeavours. A very thankful post, Sir. I do agree that Mani is one of the most effective staff that we have had so far. He will be sweetly missed throughout our stay in YCD. Keep on scribbling down in here, and a wonderful weekend! Yes, Riks, you are right. Thanks for reading this post and leaving a comment. enjoyed reading this sweet post. yup he ll do his best. GOOD LUCK!!!! Many thanks for your nice comment. Keep checking back la.